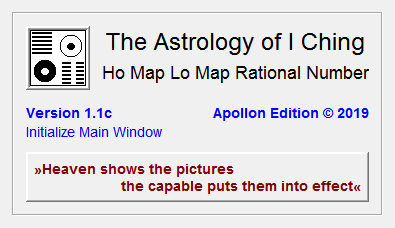 This shareware program is based on the book "The Astrology of I Ching" by W.A. Sherill, published by Penguin Books, ISBN 0-14-019439-8. The software creates for your date of birth or a specific event a basic analysis with the hexagram of the early and late heaven and their yearly cycles. For each year and the dayly cycles some texts are displayed.